IS JERUSALEM ABOUT TO BE DECLARED AN INTERNATIONAL CITY IN WHICH A COMBINATION JEWISH TEMPLE/MUSLIM MOSQUE/ CHRISTIAN CHURCH CAN BE BUILT? Title: IS JERUSALEM ABOUT TO BE DECLARED AN INTERNATIONAL CITY IN WHICH A COMBINATION JEWISH TEMPLE/MUSLIM MOSQUE/ CHRISTIAN CHURCH CAN BE BUILT? Subtitle: Sudden developments seem to indicate that Bush, Sharon, and Arafat are cooperating to complete Steps 3 and 4 of the New Jerusalem Covenant Project. The temporary False Peace may just be around the corner! "Of all the outstanding issues in the way of an Israeli-Palestinian peace deal, the status of Jerusalem is one of the most complex and sensitive. It is one which seems to offer little scope for compromise ... The vast majority of Israelis insist that a united Jerusalem will be the eternal capital of the Jewish state. With equal insistence, the Palestinians say that the Arab eastern part of Jerusalem - where the al-Aqsa Mosque and the Dome of the Rock, sacred Islamic sites, are located - should be the capital of their new state. Is one solution to make Jerusalem an international city? This could involve administration by the UN, or a shared municipality, or to make it a demilitarized city of all the faiths who worship there." When an Illuminist mass media outlet like BBC News starts to publicize a proposal that closely parallels a key part of the New World Order Plan to produce Antichrist, you have to start wondering if this sudden development might be conditioning! A key part of the plan to produce Antichrist is a spiritually internationalized Jerusalem! For those who might be new to Cutting Edge Ministries, let us back track for a moment to capture the necessary details so you can understand the importance of this BBC News call for a spiritually internationalized Jerusalem. On August 18, 1991, I was sneaked into a Members-only Seminar of the House of Theosophy. The New England Director, Bill Lambert, had just returned from a 3-year stint as a member of the New World Order planning committee entitled, The New Jerusalem Covenant Project. Major new decisions had just been made, and he wanted to share them with his followers. In the months prior to Lambert returning, one of his members had become Born Again, and had been working with me to teach me in detail the plan to produce The New Age Christ [Antichrist]. This person was still officially a member of the House of Theosophy, so he could attend, and could bring a guest. The House of Theosophy was founded in 1875 by Madame Blavatsky, and was Black Magic Witchcraft from the beginning! In the 1920's, Adolf Hitler and some of his men attended seminars in Switzerland; it was from the Theosophists that Hitler learned the Secret Doctrine, the document upon which Hitler based much of the rationale for carrying out the Holocaust against the Jews. Therefore, the House of Theosophy is deep, dark, and sinister Black Magick Witchcraft. When I was told that the name of this seminar was "Possible and Probable Events In The Future", I was hooked and ready to go. I brushed up on my special note-taking techniques that I had perfected in college, but had not really used for over 30 years. [Read my verbatim notes, along with explanation, in NEWS1052]. "Sometime between 1985-2010, the following scenario will unfold, depending only on the right set of circumstances: Moslem and Jewish areas in Jerusalem will be combined with Christian to create the New Jerusalem Covenant." Lambert maintained that four distinct steps needed to be taken so as to prepare the way for Antichrist to arise. Special preparation was needed before these three areas in Jerusalem could be combined into one Inter-Faith section. Step 1 -- First, three conferences needed to occur simultaneously -- Religious Conference, Economic Conference, and Political Conference. 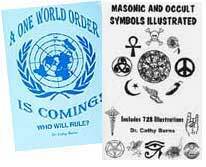 These combined conferences would produce a certain kind of mystic power that would enable the New World Order planners to move the peoples of the world into whichever direction they wanted to go. Step 2 -- After these three simultaneous conferences, a Fear of War needed to be set in place, and maintained until The New Age Christ arose. Step 3 -- Muslim, Jewish, and Christian segments of Jerusalem would be combined into one for the express purpose of building an international combination worship center, which Lambert dubbed a Temple/Church/Mosque in Jerusalem. Step 4 -- At this point, the Roman Catholic Pope will travel to Jerusalem to announce that, from this moment on, all the religions of the world are One, are united, and he is their top leader. Listen to Lambert: "At the proper moment in history, the Pope will visit the combined Jewish/Christian/Moslem sector of Jerusalem to announce that all religions should be combined into one. This action will then finally break the Middle East logjam." Suddenly, after speaking of Step 4, Lambert begins talking of the appearance of Antichrist! The appearance of Antichrist could logically be thought of as Step 5 of the New Jerusalem Covenant Project! STEPS ONE AND TWO HAVE ALREADY OCCURRED! Then, from September 4-10, a global economic conference was held, in exact parallel to Lambert's explanation of the New Jerusalem Covenant Plan. The head of this conference was Mikhail Gorbachev but its co-chairman was none than Colin Powell, who is now our Secretary of State! From September 6-10, a political meeting was held attended by the regular delegates. It was called the Millennium Assembly of the United Nations. These three meetings from August 28-September 10, 2000, perfectly fulfilled Bill Lambert's three simultaneous conferences that comprises Step 1 of the New Jerusalem Covenant Project. Step 2 is the creation of the Fear of War. Right on schedule, Arafat began the Palestinian Intifada on September 29, 2000, just 19 days after the three Antichrist Conferences ended on September 10! Since then, Arafat has ratcheted the war up rung by rung by rung, and Israel has played along by not taking the kind of strong military and police action that Americans would demand if it were their citizens being murdered and their cities being blown apart by suicide bombers. Fear of war is a reality right now in Israel and according to Lambert, it is going to continue until Steps 3 and 4 are realized. Step 3 needs to occur -- Jerusalem must be declared an international city, so that all members of the three major Monotheistic religions of the world can worship together in peace! Jews, Muslims, and Christians will all be allowed to worship in this new international city and can even eventually worship in an Ecumenical Worship Center! This is the plan; how are current world events seemingly occurring that would fulfill this occult plan? In the BBC News article, above, the author, writing in the editorial section called Talking Point, is suddenly proposing that Jerusalem be declared an international city for the express purpose of making it "a demilitarized city of all the faiths who worship there". This proposal is exactly the plan that Lambert was laying out! Once Step 3 is in place, Step 4 can occur. "At the proper moment in history, the Pope will visit the combined Jewish/Christian/Moslem sector of Jerusalem to announce that all religions should be combined into one. This action will then finally break the Middle East logjam." The Pope will begin his office as the False Religious Prophet of Revelation 13:11-18 right here, in Jerusalem, with this announcement. Once the New World Order Religions is officially declared at this moment, then the World War III designed to produce Antichrist can commence! Checking back to our feature article, we can see that this editorial Talking Point article might be conditioning to get the peoples of the world to thinking about internationalizing Jerusalem. However, this article is not coming out of thin air, nor is it occurring in a vacuum. Let us go to a couple of other intriguing events in the past several weeks that did not make sense in a normal framework. When something does not make sense, we are to seek another sense. Once we do this, you might be surprised at the outcome. "JERUSALEM (November 6) - The Palestinian Authority expects US Secretary of State Colin Powell to present the outlines of a peace plan at the UN General Assembly session November 10-17, Bassam Abu Sharif, an adviser to PA Chairman Yasser Arafat, said yesterday. Serious contacts are under way to arrange a meeting between Arafat and President George W. Bush during the session, he said ... The PA wants the US to be more specific in its support for a Palestinian state, stressing the state should include the entire West Bank and Gaza Strip, with some adjustments to suit both sides' needs. The PA wants to return to the proposals and understandings of the Taba talks ..."
In late September, Israeli Prime Minister Sharon suddenly stated that he supported a Palestinian State and would give one to Arafat if he would just halt the violence. Jews in Israel suddenly collectively inhaled, taking in a huge breath of surprise, as Arafat had never been willing to halt the terror for any reason, at any time, and for anyone. Since Sharon understood this fact, and since he is a former army general, everyone expected that the words "Palestinian State" would never come from his lips. Just a few days later, President Bush said essentially the same thing, under the same conditions. Once again, people were dumbfounded, for the Palestinians originated the concept of terror in the 1980's to achieve their goals. Arafat's men were the ones highjacking airplanes all throughout the 1970-1980's; Arafat's men were the ones who slaughtered 11 Jewish Olympic athletes during the 1972 Munich Games; Arafat's men were the ones who originated and perfected the suicide bombers. And, now, both President Bush and Israeli Prime Minister Sharon want to give Arafat his own Palestinian state? Such a proposal seems to fly completely in the face of President Bush's global war on terrorism. Further, Sharon was mixing his words of a Palestinian state in with opposite stern words, calling Arafat a terrorist on the same scale as Osama bin Laden, and stating that he will treat Arafat in the same manner as Bush is treating bin Laden. Just days ago, the U.S. State Department placed several Palestinian terrorist groups in its global list of terrorist organizations the U.S. was determined to root out and destroy! Meanwhile, Arafat is not letting up the terrorist attacks. His men continue to shoot at civilians, spraying cars and buses with automatic machine gun fire, killing 16-year-old children. Several suicide bombers are intercepted on their way to blowing up some more innocent civilians, and one news report even said Arafat's men had attempted to assassinate Sharon. Thus, even though we have mixed messages over the past 6 weeks from all parties concerned, we arrive at the totally illogical story, quoted above, where Palestinian authorities fully expect Bush and Powell to announce a peace plan at the United Nations meetings from November 10-17 that includes a Palestinian state. British Prime Minister Tony Blair might have come close to the truth when he proposed that American and British troops patrol the border areas to "prevent" any more terror attacks. However, in the past, Israel has attempted to "solve" its security problems with international armed forces, and has been bitterly disappointed with the results. We believe it possible that either President Bush or Secretary of State Colin Powell will announce a "breakthrough" peace plan -- possibly on November 11 -- that will give the Palestinians some kind of a state, albeit with strict Israeli controls. But, further, it is possible that Bush's plan may internationalize Jerusalem, and that Sharon will support such a move "in the interest of peace". If this occurs, Step 3 of the New Jerusalem Covenant might materialize: Jerusalem might be declared an international city and the United Nations might then vote to make this declaration official. The peoples of the world would believe they suddenly had "peace in their time", and would exult greatly. People might even be saying "we finally have peace and safety". Once Jerusalem is internationalized, the Roman Catholic Pope would travel to Jerusalem to announce that, from that moment on, all religions of the world were one, and he was their top leader. Such a declaration was foretold by Lambert during his August 18, 1991, seminar, and would fulfill Step 4. Once Lambert declared that the Pope would make this declaration in Jerusalem, he immediately launched his teaching about the appearance of The New Age Christ. You might even consider the appearance of Antichrist as Step 5 of the New Jerusalem Covenant Project, as we stated above! The "Peace and Safety" generated by this "Peace Plan" would soon disappear in a new round of fighting and terror, but this time, American forces might be fighting the Palestinian terrorist groups Hizbollah and Hamas, now located just north of Israel in Lebanon. Osama bin Laden, who would be expected to view the creation of an emasculated Palestinian state with great disdain might just do something really crazy to set off all-out regional war. He might, as Jewish author, Barry Chamish, warned, even use small nuclear weapons to blow up Mecca during Ramadan, blaming the United States, or possibly Israel. Or, bin Laden might blow up the Dome of the Rock, blaming it on Israel. Either action would initiate a global war -- jihad, holy war -- between Muslims and the West. If Bush announces a "breakthrough" peace plan on November 11, when he speaks to the United Nations, know that such a "peace plan" would be very short-lived. Very soon, after Illuminist objectives are reached, the planned World War III will erupt, and out of the dust, smoke and ashes Antichrist would come striding. Such is the plan. We are looking with great interest at November 11, 2001, when President Bush is scheduled to address the United Nations. Since the World Trade Center and Pentagon attacks were carried out so carefully following the number, '11' [Read NEWS1533, NEWS1538, and NEWS1541], we are interested in this date, the 11th day of the 11th month, 2001. If Bush speaks to the United Nations at 11 o'clock, he will have a "triplicity" of elevens. The last time the Illuminati staged an event on the 11th hour of the 11th day of the 11th month, was on November 11, 1918, when the Armistice ending World War I was signed, officially ending that war. You see, the Illuminati was signaling to the rest of the occult world that they had just successfully completed the first world war, as foreseen by Albert Pike in his demonic vision [Read NEWS1015, NEWS1056]. With the successful completion of the planned World War I, occults would understand that World Wars II and III would follow in due course, and knowing that Antichrist would come striding out of the last world war. When President Bush addresses the United Nations on the 11th day of the 11th month, 2001, the time period between the signing of the Armistice in 1918, and Bush's address in 2001 will be exactly, to the day, 83 years. When you add this interval as an occultist would -- 8 + 3 -- you get another '11'. We shall have to wait and see, as Jesus stated, "as wise as serpents, but harmless as doves". We are most definitely not predicting any event, but the parallels of current events to the New Jerusalem Covenant Project are too close to be accidental. Truly, the events of the day demonstrate that we are at the End of the Age, very near to the appearance of Antichrist. Are you spiritually ready? Is your family? Are you adequately protecting your loved ones? This is the reason for this ministry, to enable you to first understand the peril facing you, and then help you develop strategies to warn and protect your loved ones. Once you have been thoroughly trained, you can also use your knowledge as a means to open the door of discussion with an unsaved person. I have been able to use it many times, and have seen people come to Jesus Christ as a result. These perilous times are also a time when we can reach many souls for Jesus Christ, making an eternal difference.